Sunday is a completely different scene from the rest of the week in London, with the typical rush replaced by casual strollers, park visits, brunch time, and–of course– the markets. Looking to spend your Sunday in style? Head out east and follow this route for a venture into the best East London has to offer. Start your day off with a bang at one of London’s largest and most vibrant Sunday markets. 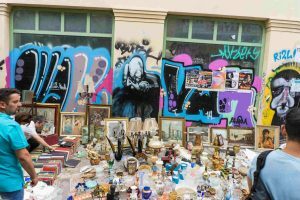 Vintage stalls rub shoulders with young fashion designers, food trucks selling hip fusion dishes compete with the curry classics. You could say it’s all of London on one street. Grab your breakfast at Beigal Bake, London’s legendary bagel joint. 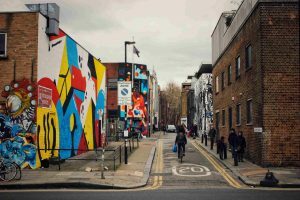 Work off that bagel by going for a wander in the district of Shoreditch just north of Bethnal Green Road, a buzzing maze of alleys filled with street art and some of the newest, coolest stores in the city. Grab a coffee to go from Allpress Espresso Bar, then make your way up to the Boundary Gardens. This green space is the centrepiece of a fascinating group of Victorian redbrick townhouses that were the first housing estate in all of Britain. Follow Hackney Road and hit up Columbia Road flower market. Perhaps London’s most colourful market, the already-beautiful Columbia Road becomes a feast of scents and colour. 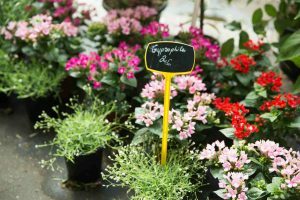 It might get busy, but if you come when the market is closing down (around 3 PM), you’ll get your begonias and perennials at a premium discount. How many cities get to boast having a farm right in its centre? 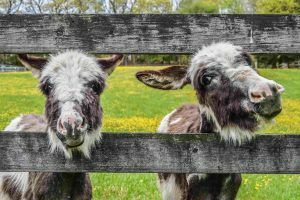 Stop by the acreage on your way towards Broadway for a chance to visit all the adorable animals (particularly star donkeys Larry and Clover). Stay a little longer, and learn about the community initiatives the farm is involved in. It’s free! 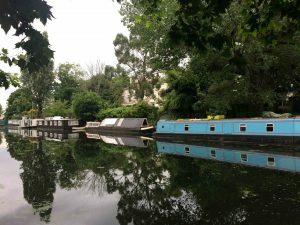 Wander along the canals, east or west, for a chance to see a relaxed side of London. Sample the wares at cafes and pop ups that line the pedestrian area. Hop up Broadway Market taste-testing a few of the excellent restaurants that open out on the road, like Buen Ayre, the Dove, or Okko. People watch in London Fields with a bevvie you’d brought along or in Pub in the Park’s outdoors area. And after doing some (or all) of the above, cap it off by watching the sunset from on high at Netil 360. It’s one of the best free views in the city—glance down and see all the amazing places you’ve been today.